I snapped this photo of these two vultures perched in the copse behind my house yesterday morning. It's not uncommon to see turkey vultures in the field behind my house but a few weeks ago I had noticed increased activity; often three or four at a time circling and landing on trees and the grass. So, I took a stroll back there and saw two deer carcasses in the brush near where it meets the open field. Directly to the left of where those two vultures sit in that picture, are more houses, a complete street to be exact; about the same distance to these birds that my house is. So, with the mystery of the increased vulture activity explained, I wonder who or what put those carcasses there. Plus, I haven't looked for about two weeks so perhaps there is something new back there. By the way, there is enough of the deer remains to rule out that someone is doing taxidermy. Plus, the remains are mixed in with tree limbs that are machine cut so it has to be someone putting them there. My guess is that someone does his own butchering and just dumps what's left in the brush. I have no problem with that, by the way and it is likely whoever is doing it, owns that lot. I was looking at the township tax maps and quite a bit of that land in that field is privately owned but I can't tell if that particular lot is owned by an individual or the township. I also can't tell if that lot borders ours and if it does, it's on the far side of his nowhere near where our lot ends. Regardless, that person's use of that land is more favorable than building something on it. Trust me, I am not complaining at all. ...or maybe I'll eat you. I guess it all depends on who's hungrier. Once again proving that America is the only nation on earth where a person with an IQ of 43 can become a billionaire, quintessential nutjob Ted Turner believes that Global Warming will cause humans to resort to cannibalism. When they passed out the Global Warming Kool-Aid, some said no thanks, some took a drink, and Ted drank about three gallons and asked for more. What a maroon. It is scary that a person with wealth and influence actually believes something like this. It some ways, however, listening to Ted should inspire all Americans. After all, if he can make it big, certainly anyone else can. Ted has certainly proved that being stupid is not a hindrance to success*. However, if becoming successful means becoming a loon like Ted, I would hope most Americans would say: "No thanks; being rational and intelligent is more important than fame and fortune." *Most celebrities have proved this too. 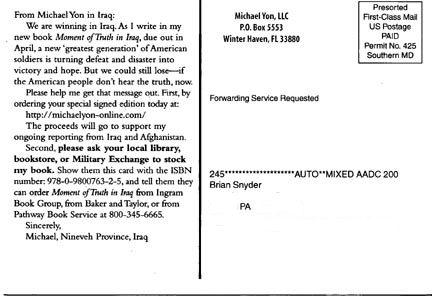 I got a postcard from Michael Yon today. 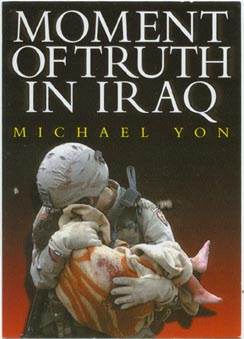 Michael is a blogger and observer who spends a lot of time in Iraq. He chronicles what he sees and though he's not a journalist, many journalists can learn a lot from him. A link to Michael's Blog is on the right. Be sure to check it out. If you can, donate to him as well. I'll ask the library I frequent if they will order the book and I have added it to my reading list, which is usually two or three books deep but I can certainly fit this one in. A Google search for "Kwame Kilpatrick is a democrat" yields 6 - SIX - results. A Google search for "Larry Craig is a republican" yields 12,000 results. "Democrat Kwame Kilpatrick" - we get 341 results. "Republican Larry Craig" - we get 10,400 results. What does this prove? One, the actions of a US Senator are more newsworthy than the actions of the mayor of the 11th largest city in the US*. A city, by the way, that has been beset with economic woes, shrinking population, and rampant crime. 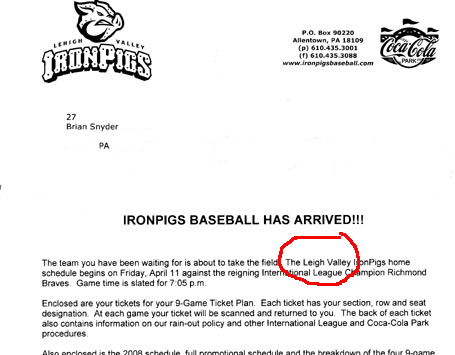 So, I suppose that scandal, corruption, and criminal activity by the mayor isn't really surprising. Two, when a Republican does something wrong, his party label follows him like a shadow, almost becoming part of his name. However, when a Democrat is accused of all sorts of debauchery, the party affiliation is treated like a non-essential piece of information. In the Eliot Spitzer vs. Larry Craig Google News watch, a Google News search for Eliot Spitzer still yields over 35,000 results and Larry Craig yields about 2,800. The Spitzer searches may be inflated some as many hits yield stories about the woman involved too. I tried to filter those out by inserting "-call" "-girl" and still get about 17,000. I am sure Google will fix this problem by late summer (there is an election this year) and make sure the Larry Craig stories outnumber Spitzer ones. As for Kilpatrick, he hits about 5,300 now on Google News so he'll be below the Craig number much sooner. *Unless, of course, if Kilpatrick were Republican and Craig a Democrat, the question would be "Larry who?" 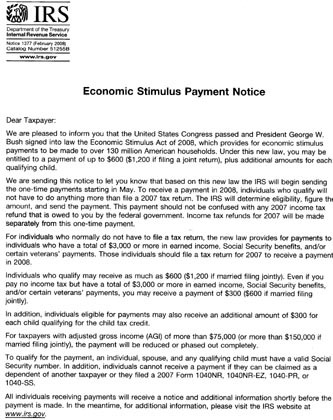 The letter informing us about receiving a stimulus came today. Instead of spending like drunken sailors like so many Americans do, anyone who gets a check should 1) use it to pay down debt; credit card debt first or 2) put into a savings account. Other good uses are retirement funds, college funds, and home improvements. Naturally, ours will go into savings right away until we decide if we need any home improvements or to pad the three college funds a little. Unfortunately, the reality is that all this package will do is augment the already rapid rising costs of goods. It's a 'feel good' move that will likely do little other than make things cost more which, of course, hinders people from paying debt or saving.